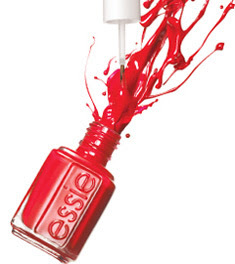 I'm really curious about Essie's Fall/Winter 2008 collections. I haven't seen any concrete information on them, but the rumor is that there will be six polishes designed to coordinate with the season's jewel-toned clothing. It's also rumored that there will be a PURPLE in this collection. I can never resist purple polish, so I hope the rumor turns out to be true! Tabe-chan, the use of the word "jeweltone" has me excited, I really hope they do something interesting! Sanna, me too! I really can't wait to see what they have! I hope they're bold. And I love purple polishes. They are the best. Anon, me too! I can never get enough purple. I'm constantly looking for more! Katherine, I hope that's the cause because those are some of my favorite colors. I'd love to see lots of metallics, purples, rich browns or shimmery browns, and definitely more green. I'm dying to know what everyone else is releasing for next season!